Reminder: We are less than 3 weeks away from the outing. Please RSVP to TWFF as soon as possible! If you are planning on attending, please answer the following information and send back to the twffoutingcoordinator@yahoo.com . This way we will know how many flies to tie and how much food and drink supplies to purchase for the outing! One additional note if you are staying in a cabin remember to bring your own linens and towels that is not provided! Staying at Big Oaks River Camp? RV Site, Tent or Cabin? Joining Group for Mullet Mixer? Are You Participating in Bud Priddy Tourney? If yes, make sure you register in advance using the link below, or mail in the attached form. Do you need to borrow club equipment? Also, register as soon as possible for the Bud Priddy Fly Fishing competition which is being hosted by the Alamo Fly Fishers (AFF) in conjunction with our outing. Please sign up by April 24th. You can register online at http://alamoflyfishers.com/bud-priddy-2017/ Payments can be made with a credit card (without a PayPal account) or with your PayPal account. $$ SAVING TIP: If you are signing up more than one person, sign each person up individually – it’s cheaper than adding guests all on one online registration form. If you prefer not to sign up online, you can print out and mail in the attached registration form. AFF would like a week’s notice on all sign-ups to place the shirt order with the right number of sizes. You can register within a week of the event and even at the outing, but you won’t be guaranteed a shirt in your size, or one at all, if there is a last minute sign-up rush. AFF will provide a measuring tape and maps of the river as part of the Bud Priddy competition. There will be prizes for… Longest Bass, Longest Sunfish, Longest Other Fish, Most Fish Caught. Friday night, we’ll have the Mullet Mixer with the AFF group – bring a side or dessert to share – TWFF will provide fried chicken from Bush’s Chicken, tea, and water. Saturday night, AFF will host a barbeque dinner for everyone. 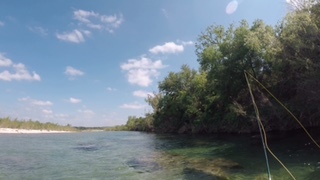 I kayaked down a portion of the Nueces last weekend on April 9, and it was just beautiful. Spring has sprung, the leaves are all newly green on the trees, the water is clear as if it’s an aquarium, there are yellow and purple wildflowers in view, plenty of wildlife… AND FISH!!! The water is so clear, you can see the fish coming out to attack the flies! As I was driving from Uvalde to Camp Wood, a huge deer came bounding out of the vegetation and ran across the road in front of my car. Thankfully she was far enough away that I wasn’t in any danger of hitting her, but she was close enough to get a really good view – absolutely gorgeous! I was told by Caroline at Big Oak River Camp that the weekend before, they had a 10 foot flood down the Nueces river. So, when we went kayaking, the water levels were higher than normal. Great conditions! 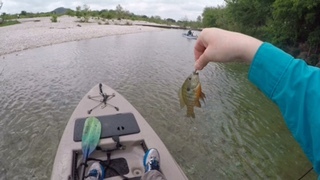 When we put in, I started to fish and within two minutes of wetting my line, I caught a gorgeous red-breasted sunfish! So pretty! I’m hoping with all the rain we’ve been getting west of San Antonio lately, the water levels will stay above normal for optimal conditions. See the attached pictures for a view of this gorgeous area and river. 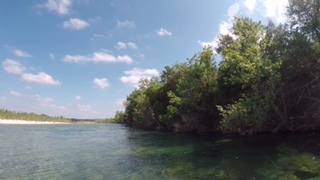 We can’t wait to go back, see all of you, and fish this beautiful area again!